That moment when you realize that you’ll be stuck with those ugly braces on your teeth for more than a year! Ugh! How often has this been the experience of people who had the unfortunate pleasure of wearing traditional braces to straighten less than perfect teeth? For many of us, it was the “braces stage” of our lives that we look back on with a level of embarrassment irrespective of how happy we are with the end result. Uncomfortable braces aren’t the only solution for straightening teeth, though. There is an alternative that can remove the potential “braces stage” in life so many of us experience. Invisalign is one such solution and the advantages are more than simply cosmetic. While Invisalign uses a clear material for patients in NJ with crooked teeth, which is considerably less noticeable than traditional braces, it provides the additional benefit of allowing the patient to care for his or her teeth (brushing and flossing) because they are removable. Patients using traditional metal braces often have issues with tooth decay and gum disease because they aren’t able to care for their teeth as effectively during the time they are wearing them. They can also be removed when you eat allowing you to enjoy food better than you might while wearing traditional braces. Invisalign is customized to a patient’s teeth and because there are no wires or bands, there is less irritation. As teeth are straightened, there is also great potential for improved overall dental health as not only can teeth be better cared for while using Invisalign, but ultimately, straighter teeth are better for dental maintenance over the long term. The Invisalign procedure is fairly simple. 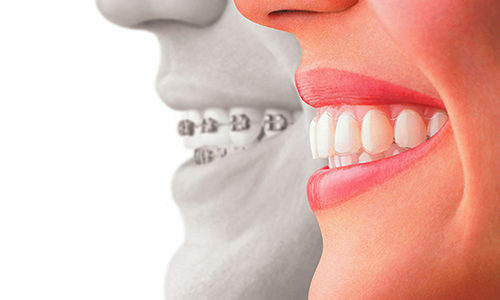 Impressions are made of a patient’s teeth so the Invisalign trays are customized for maximum comfort and effectiveness. With the use of 3D imaging, a patient gets to see how their teeth will look at the end of their treatment. Over the course of six months to a year, a patient returns periodically for a new customized aligner and that’s pretty much it. Obviously, each patient is different and has different degrees of tooth alignment necessary to straighten their teeth, but Invisalign is not a “one size fits all” procedure. The advantages essentially boil down to customization, comfort, aesthetics (they’re practically invisible), removable (for eating food and brushing/flossing) and the impressive end results as evidenced by a host of successful procedures and satisfied patients. If you think Invisalign may be what you or someone in NJ you know would like to know more about, contact Smilepartnerz at (973) 694-5101.